Wow! 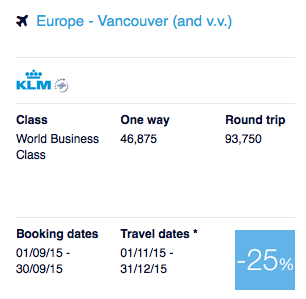 It is nice to see that some Canadian cities have returned to Air France KLM's Promo Awards. We haven't seen any since April, so somewhat good news albeit not great as the discounts aren't the best for this set. The offer this time is only for 25% off Business Class on KLM out of Vancouver and Montreal or on Air France from Toronto to anywhere in Europe. For some if you were planning to redeem anyways for flights during the promotional perioed you might as well grab the 25% if it works for you but in general its nothing to write home about! What are the promo awards? The promo awards are a discount of 25-50% off the regular Flying Blue mileage requirement for select Air France, KLM, Air Europa and Kenya Airways award tickets in select cabins. To take advantage of this deal you must book your promo award ticket by September 30th for travel between November 1 and December 31st, 2015. More details can be found here.